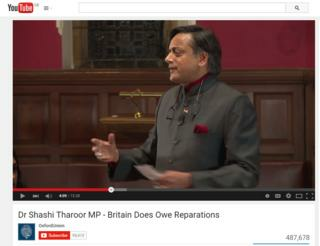 Should the UK pay reparations to India? An Indian politician's passionate argument in favour of reparation payments from the UK to its former colonies has become an unusual hit, racking up half a million views on YouTube and prompting a vigorous debate online. It doesn't seem like the most promising start to a viral video. Shashi Tharoor, a career diplomat and former Indian government minister, stands up in front of the Oxford Union, a debating society at the University of Oxford. He's the seventh speaker out of eight debating: "This house believes Britain owes reparations to her former colonies". Throughout his 15-minute speech, Tharoor speaks about the "moral debt" owed by Britain to India - and argues for economic compensation. "India's share of the world economy when Britain arrived on its shores was 23%," he says. "By the time the British left it was down to below 4%. Why? Simply because India had been governed for the benefit of Britain. Britain's rise for 200 years was financed by its depredations in India." Although Tharoor didn't provide attribution for his statistics in the speech, some historical economic research backs up his account - although his opponents in the debate argued that India benefited overall from British rule. The passionate speech touched off a huge debate online, with many young Indians commenting on the video, which has been viewed half a million times since being posted on YouTube last week. "Well argued Shashi Tharoor. Britain's been taking too much credit and too little flak for all it's impact when it ruled India," one viewer commented. "A lot of truth has been exposed about colonialism," another said. "The Brits only looted and got kicked out when enough became enough." The comments on YouTube were dominated by young Indians, and Tharoor's name was among the top trends on Facebook in India for several days. "A fine speech - Reparations, well yes. But more importantly, an apology, a humble admittance of the horrors," one commented on Twitter. But not all Indian viewers agreed with Tharoor. "Asking for reparations is just stupid," one commented "They [owe] us nothing... even if they have taken something in the past. We need to learn how to organize and manage things ourselves." India got £269 million in aid from the UK in 2013, and some have questioned why a nuclear-armed nation with a space programme and a booming economy should still get British aid. Overseas aid is one of four UK departmental areas being protected from big budget cuts as part of Conservative plans to reduce debt. Tharoor is a Congress Party MP who known for his suave image and skilful speeches. Prior to his parliamentary career he served as a UN official, and ran a close second to Ban Ki-moon in the UN's secretary-general selection process in 2006. As for the Oxford Union debate - Tharoor's side won 185 votes to 56.